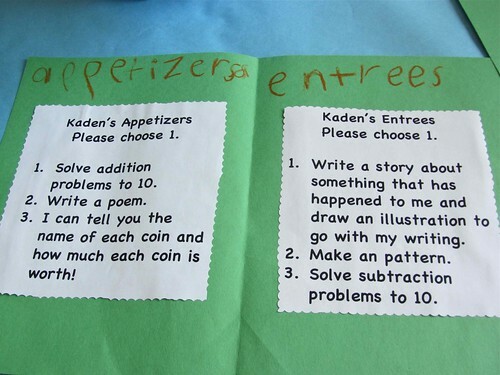 This afternoon I was invited to go to the Kindergarten Cafe with Kade. I had no idea what to expect since I had never heard of it before. I walked in the classroom and found Kade sitting at a table with an open seat next to him. I sat down and was presented with a menu. We chose the first appetizer. On the table was a bucket with Kade's name on it. Inside were a few papers and other objects in which to do the chosen appetizer and entree. Kade sped through the addition page. Then he decided he wanted to count the money in the bucket. That didn't seem filling enough so he and I wrote a poem. I really don't think we'd win an award with our poetry. Then we moved on to the entree. We picked the third one. Can you tell he likes math? He finished that page and on the back of the menu was the dessert options. We both choose the ice cream sundae over the cupcake. It was a nice way to spend the afternoon, well 30 minutes of it, and see what Kade can do. Although I already know but this way he can show off a little. Mattey had an all day field trip to Amish country. Luckily they had a lot of tours inside so she didn't melt in the 90 degree weather. Meg had a game tonight. Mickey was the only one to go. It was just too hot. And of course it had to be a good game. Maybe next time.